One of the drawbacks of this gig is that there's such a constant stream of new places to eat (many mediocre to worse) that after I've done my duty and weighed in on as many as I can, there's never enough time to frequent the ones that really distinguish themselves (I know, I know). I keep telling myself that the reason I haven't yet published a proper review of Zebda, the North African-leaning Mediterranean take-out partnership between Tassili Cafe owner Mohammed Djeddour and ex-Mundial-Cocina Mestiza chef Katie Garcia, is that they haven't yet fully ramped up to their promised offerings—they just started entrees two days ago. The truth is, everything I've tried there is so good I don't really want to move on. 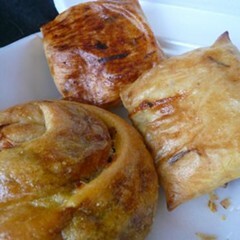 Today, for instance I popped in and grabbed the first things I saw, a trio of savory stuffed pastries—bastilla—each one with a distinctly different filling. One was stuffed with vermicelli (Garcia later told me it was of Spanish influence), green olives, and fish. Another, looking something like a cinnamon bun, was instead laced with carrots, zucchini, sauteed onions, and a spicy mix of turmeric, saffron, and cumin. But the real knockout was a square phyllo pocket packed with shredded chicken, carrots, and raisins—"a Moorish thing," said Garcia— that emitted a fragrant burst of cinnamon when I breached its flaky exterior. Good, good stuff. As I said, things are still evolving at Zebda. Not everything on the menu is there every day, but while they're waiting for things to get busier, Garcia and Djeddour are still building up. They're putting in shelving to sell things like preserved lemons and olive oil from Djeddour's family's trees in Algeria. They're also going to offer counter seating (until then you can take your order next door to Tassili if you don't want to wait to get home). And Garcia is keeping busy with private catering, which she says is not limited to the "modern Mediterranean" repertoire at Zebda. Among other things, she's still cooking stuff from Mundial, and says she just put together a French menu for a client. Incidentally, the southwest corner of Elston and Pulaski is quite the little souk. In addition to the grocery and butcher two doors north of Zebda and Tassili, where you can stock up on merquez sausages, there's Pomera Cafe around the corner, offering a small selection of pastries, sandwiches, pizza, and items like mhageb, the thin crepe stuffed with a spicy mix of onions and tomatoes you see below.